Getting back to my comic roots, I’ve decided to start a weekly review of what I believe are the best three comic books of the week. You can think of this as a pull list if you want to help decide what to get out of the multitude of options each week. Since Comixology, unfortunately, removed theirs I’ve been looking for a site that would fill the void. So my hopes are that this will help fill that void even if it’s only a small presence. Or perhaps this will simply act as a piece of brief information on the current landscape and debriefing of the comic landscape. Hopefully, this will launch a discussion page for what the LRM audience feels about each week’s comics growing the presence of the medium on the site. For the tentative breakdown, there will be one review from Marvel’s and DC’s listing with another deemed best of the rest which can either be from the lower tier publishers or second comic reviewed from Marvel or DC. So now that the formalities are over with let’s flip the page. While Netflix may have pulled the plug on Marvel’s Defenders the team is still going strong in the comics albeit sporting a different roster. The Defenders: The Best Defense is built on the backs of four one-shots focused on each team member (The Hulk, Doctor Strange, Silver Surfer, and Namor). The story involves a cosmic train that eats planets consuming their energy in the same fashion as Galactus. Led by the astral projection of a future version of Doctor Strange the four gather to save the Earth by being devoured. Throw in Mephisto, a planet full of Atlanteans, and Hulk dealing with the events from Immortal Hulk lead to an interesting origin for this new team. The art for this issue is led by the team behind Immortal Hulk, the best-drawn series for Marvel at the moment. Joe Bennett’s art capitalizes off of thin line work to produce well-defined detail in most panels. However, consistency is a tad off as some panels aren’t drawn in fine detail. The panels are tilted giving inflection of emotion during the impactful moments in the issue. However, this was done too frequently which took away some of the impactfulness due to oversaturation. Defenders: The Best Defense #1 is a launching pad for a new Defenders team that will likely be a large focus of Marvel’s going into 2019. There still remains a singular focus on each hero which will likely begin to formalize a team aspect rather than one from necessity. Since Teen Titans Special back in July the look of the team has drastically changed with the introduction of new characters replacing beloved parting members like Beast Boy, Raven, and Starfire. One of the new members that are quickly becoming a fan favorite is Lobo’s biological daughter Crush. The art is solid but nothing groundbreaking as there is a bit of disharmony between the guest art team. Gho’s coloring often overpowers Henriques’s inking which is sometimes distracting. Panels are standard though they do vary in count and overlying depth to inflect emotion. Though Crush’s backstory resembles Superman’s only with altered circumstances which DC uses a crutch all too often it’s hard to not like Crush. 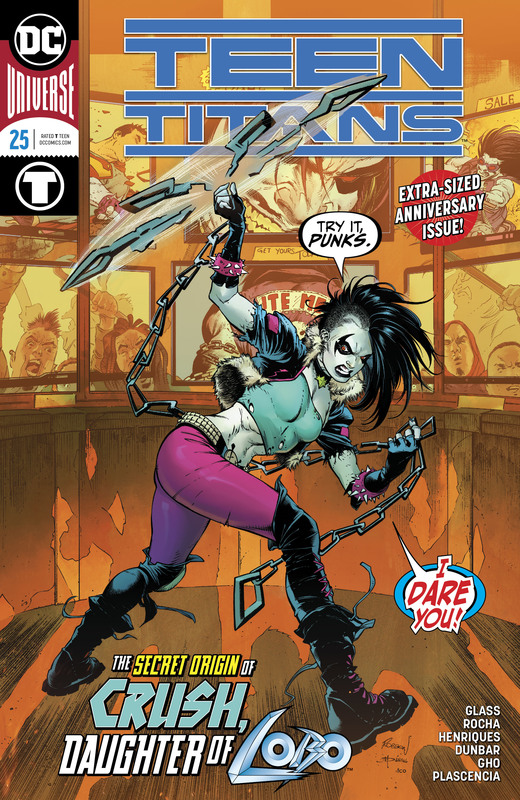 She is the walking representation of teenage angst which makes her character easy to relate to which is why she has become a leading character in the new Teen Titans. The ending to the thrilling “Fortress Vader” arc in the revamped Darth Vader series. This series focused on the creation of Fortress Vader on Mustafar adding yet another layer of lore to the Star Wars canon. Vader searching for more information on the lore of dark side of the Force builds his tower in hopes of opening a door to the dark side. With ancient Sith Lord and sculpture Momin guiding the creation of the tower it brought to fruition. Vader enters the portal and learns the truth behind the dark side and fails to save Padme. While in the portal a young Anakin has a nightmare about Vader bringing the path to come full circle. With this new knowledge, Vader starts to realize Sidious is concealing information. With Marvel putting a lot of resources behind their Star Wars books the art is always top notch. This is the case once again as from penciling, inking, and coloring there is not a flaw in this issue. Through the gateway, Vader walks through his past evolving the further he goes in is impactful as the reader can feel Vader’s discomfort. 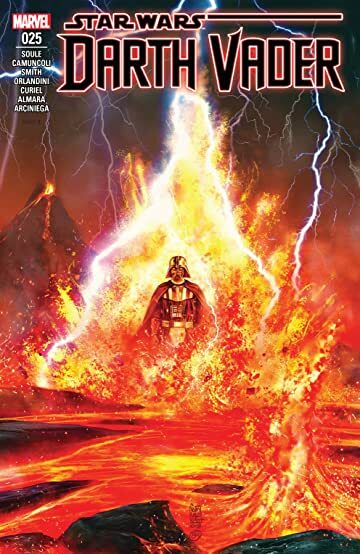 While “Fortress Vader” was a good addition to the Star Wars lore the final issue was lackluster in comparison to the interesting issues that came before it. I suppose this was necessary due to having a set canon in the future where the series needed to tie up loose ends but killing off the interesting part of the arc leads to a disappointing end. Let us know your thoughts. What do you think is the best comic of the week?